Does you umbrella flip every time when it is windy and people laugh at you? Do you want to see where you go when it is heavy rain and windy? or Maybe do you want to have high quality and nice looking umbrella? 1, Made of 100% PE which is more resistant and Transparent. 2, The shape of the umbrella is like a mushroom, so it gives you more coverage. 3, The PVC canopy is completely waterproof and sturdy alloy ribs are highly durable and capable of withstanding wind and rains. 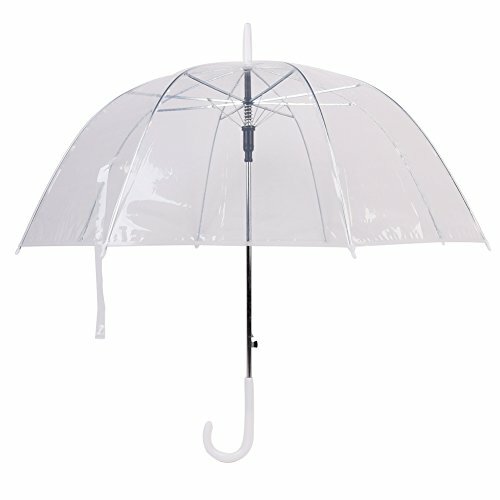 4, With our XUANLAN transparent dome shape umbrella, you can keep an eye on your surroundings while protecting your self from rain and gusting wind. Rainy days no longer have to be so dull and gloomy. Resistant to wind and heavy rain, perfect for outdoor weddings or events! If you have any questions about this product by XUANLAN, contact us by completing and submitting the form below. If you are looking for a specif part number, please include it with your message.